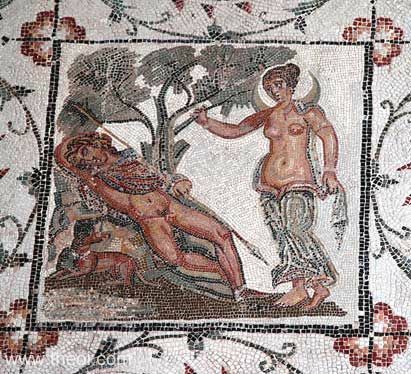 The sleeping shepherd Endymion is visited by his lover, the moon-goddess Selene (Roman Luna). The hero reclines beneath a tree, with a hunting spear in one hand and a hound at his side. The goddess is clothed in a silvery robe and crowned with the crescent of the moon.